Three surge-protected power strips fastened to the bottom of these iPad storage carts allow for convenient charging. 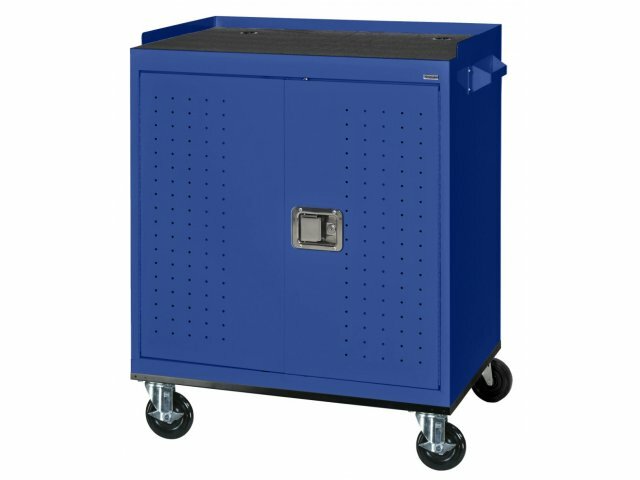 Keep iPads and other computer tablets safe and secure with these Tablet/iPad Storage Carts from Sandusky. 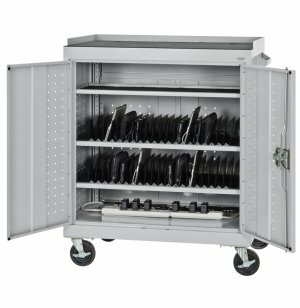 These carts feature a 40-tablet capacity, with 20 tablets on each of two shelves and an upper inside shelf for laptop storage. Both the cart top and each of the shelves have anti-skid mats for added security. Wire grommets run from the top to the inside of the cart for convenient cable management; mounting clips are included to run additional wires from the front or rear of the cart. All doors feature full piano hinges and 2-point locking paddle handles with keys. Ventilation holes provide air circulation. Available in a wide choice of scratch- and peel-resistant, powder-coat finishes. Full Charging Capability: These tablet storage carts include 3 surge-protected power strips for easy charging. 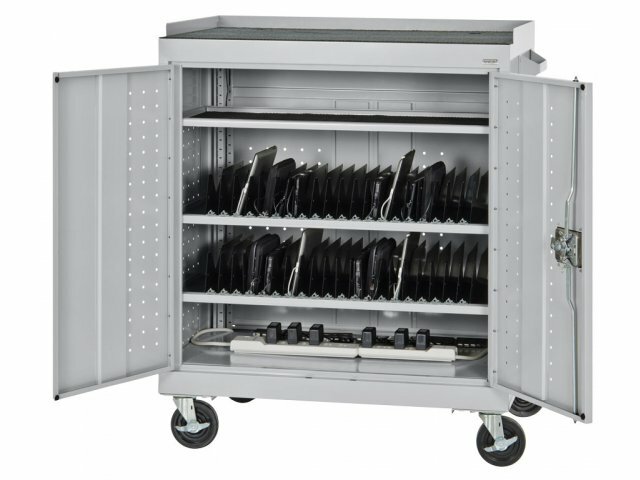 High Capacity: Each storage cart can hold up to 40 tablets as well as additional laptops. No-Skid: All shelves, including top of cart, have anti-skid mats for extra security. Wire-Management: Wires can be run from the top of the cart to the inside, as well as from the front or rear of the cart. Secure: Doors feature 2-point locking paddle handles with keys. Built-In Ventilation: Ventilation holes provide air circulation on all sides. Fully Mobile: Rolls easily on four quality casters. No-Peel Finish: Powder-coat finish is peel and scratch resistant. Color Options: Available in a wide selection of classic colors.